I am not a character from a Stanley Kubrick movie. I am “Small Number” and it was exactly on November 22d of the Year 2009, that I was born in the Canadian Rockies at the intersection of three glacial valleys at a place overlooking the rushing Bow and Spray Rivers, and not far from the birthplace of another one of my enlightened ancestors, Chief Crowfoot (1830-1890) of the southern Alberta Blackfoot Nation. I happen to get into a lot of mischief and my first video tells the story when my grandmother wanted me to stay outside after my run-in with a skunk. She set a counting challenge which she assumed would keep me busy for a long time. Not so! You can watch another one of my adventures here. I have risen out of the minds and souls of mathematicians, math teachers and First Nations Elders. I was conceived at a “First Nations Math Education Workshop” at the Banff International Research Station (BIRS). My adventures are relayed by Veselin Jungic (SFU) and Mark MacLean (UBC), illustrated by Simon Roy, and narrated by Rena Sinclair of the Siksika Nation. Eldon Yellowhorn, an SFU palaeo-Indian archaeologist and his sister Connie Crop Eared Wolf, have helped produce Blackfoot translations. You can watch them here and here. The idea of conceiving me emerged while they were discussing the various barriers to teaching math effectively to First Nations students of all ages. Since 2006, three workshops (with a fourth scheduled for 2012) have been held at BIRS to discuss the issues of First Nations math education. According to Melania Alvarez-Adem (Pacific Institute for the Mathematical Sciences), Genevieve Fox (First Nations Adult and Higher Education Consortium) and Sharon Friesen (University of Calgary) who have been driving the workshops, it is estimated that in British Columbia alone, by grade 4 (age 9-10), First Nations students lag behind their nonNative classmates in basic tests of numeracy by around 20%. By grade 10, only 47% of First Nations students meet the expectations in numeracy, versus 77% of non-Native students. Overall, high school graduation rates are 40% lower in Native communities than the provincial average, leaving those who fail to complete grade 12 in a very poor position when it comes to further study or employment. If discrepancies in opportunities and in quality of life are to be redressed between First Nations and others, then the issue of trends of such poor performance in mathematics will have to be dealt with. Besides the above creative teaching material, the BIRS workshops have also led to significant recommendations and advances. One conclusion is that math is a true centerpiece of traditional First Nations knowledge and that First Nations students should be expected to perform as well in the subject as the rest of the population. Another identified a need for a much stronger emphasis on teacher training in the Canadian education system. 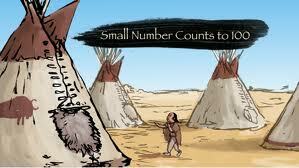 The adventures of “Small Number” should play an important role towards this goal. Thank you Veselin, Mark and all the others for this important contribution. This entry was posted in Banff International Research Station and tagged mark maclean, sharon friesen, siksika nation. Bookmark the permalink.